At 4'11" and barely one hundred pounds, Sokaku Takeda was indeed a small man, even by Asian standards. Seeing him walk through the crowded streets of Tokyo carrying his kenjutsu (swordfighting) gear made for a strange sight in 1882 - after all, it was a time of peace and progress in Japan - a nation poised to take its place with the rest of the modern world. Passersby shot odd glances as the tiny warrior strode past when a group of construction workers took notice. "Hey, look at the little swordfighter - a bit old-fashioned for kenjutsu these days, eh pal?" Takeda's abrupt reply of "keep your mouth shut" angered the workers. When one of them attempted to grab him by the lapel, his sword was inadvertently dislodged from its scabbard, slicing the chest of the antagonist. The cut was superficial, but it was deep enough to cause blood to drench the worker's torso, making the situation appear grave. Armed with picks and shovels, the other workers rushed the sword wielding Takeda in an effort to subdue him, but each man who came near him was instantly cut down. Finally, Takeda could no longer hold off the relentless attack of over twenty workers. By the time police arrived on horseback, a large crowd had encircled the grisly spectacle as Takeda was sprawled out on the ground unconscious, still clutching his prized sword. What began as an act of public taunting ended in a showdown that took the lives of a dozen men. Although Takeda was eventually acquited of charges brought against him by the workers' families, he was still regarded as the heavy in the attack because he was armed with a conventional weapon. But if you examine the details of this unfortunate event, you'll find that Takeda neither started the verbal nor physical aspects of the assault that led to a massacre. At one time, samurai had the legal right to execute anyone they deemed as disrespectful (kirisute gomen) before the tenets of Bushido became more strictly codified. Today, restraint and self control are as much a part of the warrior's way as they are of common sense and decency. Sometimes, the best technique to be found in the martial arts is to simply keep quiet and walk away. Ahhh, good post and great lesson. John, what would be the difference, then, between self-restraint and self-control then? I would think in this circumstance (or most any other circumstance), they'd pretty much be the same thing or practically the same thing when it comes to practicing martial arts? Interesting story. It is surprising that he was held blameless, as the sword ban was already in effect for several years and the notion of kirisute gomen was long outlawed. One of my favorite stories... Takeda was admonished by the judge who stated the entire incident was the result of him carrying the sword. He was told that "the age of the sword was over." Ultimately this lead Takeda to learn and focus on jujiutsu, notably Daito-ryu Aiki-jutsu, and he ultimately became the headmaster of the art. 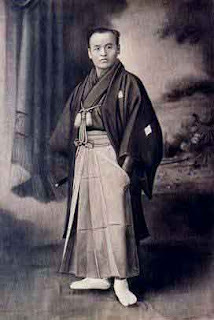 This in turn allowed him to influence many others, most famously Morehei Ueshiba , who received a teaching license from him but then refined the techniques further from a pacifist perspective to develop Aikido. Initially Sokaku was completely focused on the sword and used it in combat and duels, killing many (12 in the incident you describe) thus spending a life somewhat paranoid that he would be attacked and killed by those seeking vengeance. I suppose they're about the same. "Self restraint" seems to have a stronger connotation to it than "self control". The original charge of manslaughter was dropped against Takeda because it was determined he acted in self-defense. Nevertheless, his sword was confiscated. It's true that Takeda spent his long life looking over his shoulder. At one point he would have his students test his food and drink to see if it was poisoned! Nice guy. I'm sure the behavior and actions of this violent man urged Ueshiba to embrace a philosophy of peace in his later years. Didn't Sokaku Takeda need to carry his kenjutsu gear with him to get from the dojo, and back home? I was under the impression that everybody walked to where they were going in 1880. Was the judge saying that it was illegal for him to train in the art of the sword? or was he just stating that it was "outdated"? If it's just outdated, then there is nothing wrong with training in it.. everyone can choose what they want to do. It's outdated to dress up like a Viking warrior, and train in medieval warfare, but many people do it as a hobby. I guess I'm just confused about the reason that he was walking around with a sword in the first place. Putting that aside.. let me get back to the reason this post exists about self restraint.. A brief exchange of a few words led to the death of 12 men. I believe that you are exhorting martial artists to treat their training seriously and to avoid moments like these by restraining themselves in potentially volatile situations. Right? Today, restraint and self control are as much a part of the warrior's way as they are of common sense and decency. It might be argued otherwise, but in his defence - he could have sliced the guy's stomach open, or slashed the arteries in the guy's arm, or lock the wrist and cut to the neck, or ... I'm sure a good number of other nasty things. It might be so much a part of him that he can't let go of it. What if I told you that you had to leave your fist and feet at home since they're weapons? Japan was going through drastic cultural changes when this incident took place. The bamboo shinai of kendo began to replace the live blade of kenjutsu - there were still kenjutsu ryu in Japan at the time (as there are today) - but the way of the samurai was coming to an end. That's why Takeda received odd looks. The wearing of the sword - as part of attire - was prohibited. Takeda was carrying his gear to wherever he was training. I believe that you are exhorting martial artists to treat their training seriously and to avoid moments like these by restraining themselves in potentially volatile situations. Right? Right, Mireille. But I'd like to point out that while ideals like "training seriously" and self restraint in the martial ways go hand-in-hand, it is possible to make them mutually exclusive as well. This was certainly the case with Takeda, who was a brilliant martial technician who ruthlessly disposed of anyone who crossed his path. Awareness is imperative in the martial arts. "The eyes must see all ways, the ears must listen in all directions" are Okinawan karate precepts. If law enforcement or security work is your calling, I suppose. I really think it's a matter of intention. What we think about we also tend to attract; so if one thinks they're a "violence magnet", then it's a good bet that's the reality they're going to create. Some additional background and I've tried to check objective sources for validity of the version I heard but am having some difficulty in a short time frame. My recollection is that Donn Draeger recounted this story in "Modern Bujutsu". Supposedly this was from 'court records'. It is said that Takeda was walking with the sword because his home/dojo was being torn down (Meiji Restoration urban renewal). Also he was not technically 'wearing' the sword but rather carrying it over his shoulder with his other personal tied at the end in a bundle ('hobo' style). He was made fun of because of his garb... he was dressed old style (if I knew how to do so in a comment I'd embed a photo of him at the time). The workers insulted, he insulted back, they blocked his path (3 of them) he took the sword off his shoulder and shoved all three but the SCABBARD deeply scratched the chest in the process... initially thought to be the blade. After a throng of several (counts up to 50 and above, some to 300!) came after him with picks and axes he then drew his sword... at least 12 killed and several (19) maimed or injured due many due to jujiutsu responses. The foreman pressed charges under the existing laws. I also believe the sword was confiscated and he was specifically forbidden to carry. Takeda was known as a crank with a short temper and experienced grim battle scenes as a child. Somewhat of an embarrassment to Ueshiba of Aikido who became pacifist because he was a follower of Deguchi and the Omoto Kyo Shinto sect. But the point of the blog is that a true martial artist has a significant power... and with power comes responsibility... the greater the power the greater the responsibility. Thus as John says it is better to be quiet and walk away... likely NONE of the grizzly incident would have occurred if Takeda had just kept walking. If law enforcement or security work is your calling, I suppose. I really think it's a matter of intention. "Oh, I won't try you. " "You must be something in a fight"
Ha the fun of martial arts. Always a debate! Be well and looking forward to your next post. Thanks for the moral lesson. Saya no uchi - translated as 'victory is in the scabbard' meaning we can win without having to draw our sword. New found tools are a lot like new toys for new shodan. Exactly Mat. I've seen a lot of swagger coming from stupid practitioners. Not all of them are new shodans of course. As for me, as a house husband, my greatest fear is to provoke someone with my kids in tow. God forbid if it happens. Funakoshi mentions something similar in his nijukun. I think it's something about 'when you walk outside the house, everyone is a possible enemy'. I'm surprised those court records on Takeda are extant. Nice research, thanks for all the info. Somebody once told me the more confident a fighter is, the less she/he wants to fight, i.e. prove themselves. That sounds noble, but the truth is we all have our buttons that can be pushed; and when they are, we like to push back - that's what makes us human. Thanks for sharing your thoughts, Mat. That the best sword in the land need not be drawn - doesn't mean it cannot be drawn. Thanks for stopping by with some sword wisdom, Eddie! Even while walking outdoors, he (Funakoshi) would never turn a corner close to a wall but make a wide circuit to avoid being surprised. Without injuring the user (student), would show how an adversary could jam improperly handled chopsticks down one's throat even as the user ate with them. It always pays to maintain vigilance. Yes, our green belts have to learn how to do that, then plunge the opponent's face into the scalding hot broth. When our instructors are teaching self defense or bunkai, they are constantly noting the difference between neutralizing the situation and taking it a step further. They are quick to point out that one thing is school appropriate, the other only if the situation is dire. Knowing how much force is needed is crucial to avoiding these types of situations. Very interesting history lesson here! Very interesting blog you have here. You come up with really thoughtful stories for us. Keep up the good work! He (Funakoshi) would quickly tip up a bowl of rice into the face of any disciple who handled it in such a way as to weaken his defense. Personally I'm partial to broth (not too hot!). ...(there's a) difference between neutralizing the situation and taking it a step further...only if the situation is dire. Exactly. Thanks for your input, BBM. Thanks, Patrick. I'll do my best!